Below are the results of analyses of the Loschbour genome. The Loschbour sample is from a Late Mesolithic skeleton found at the Loschbour rock shelter in Heffingen, Luxembourg. The skeleton was dated to 6220–5990 BC. Loschbour belonged to Y haplogroup I2a1b* and mitochondrial haplogroup U5b1a. Loschbour didn’t have any of the K12b Gedrosia component, which is associated with R1b, and he also didn’t have any of the K12b Caucasus component, which is associated with R1a. I think that the Aurignacians belonged to Y haplogroup I, and that they entered Europe from the Middle East through the Balkan peninsula. I think that the Gravettians belonged to Y haplogroup R, and that they entered Europe from Central Asia or Siberia through Russia. I think that around the start of the Last Glacial Maximum 25,000 years ago the Gravettians split into a Western European group, which gave rise to R1b, and an Eastern European group, which gave rise to R1a. 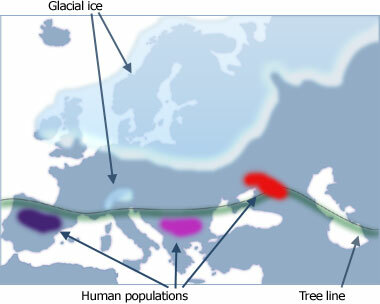 I think that the three maps below, taken from this page, accurately depict European genetic prehistory from the height of the Last Glacial Maximum to the start of the Neolithic. I think that the reason that Loschbour and La Braña 1 (a Mesolithic sample from Spain) show no signs of admixture from R1b people is that they or their ancestors had only recently spread to Western Europe from the Balkan peninsula, at some time after the start of the Holocene 11,700 years ago. It was estimated here that the modern-day French are the product of an admixture event that took place around 4950 BC, between a Sardinian-like population and a Burusho-like population. The Sardinians in this analysis are stand-ins for Europe’s first farmers, while the Burusho are stand-ins for R1b Indo-Europeans. The 4950 BC estimated admixture date is around the time that the agricultural Linear Pottery culture spread across France. The analysis therefore implies that R1b Indo-Europeans were already in France at the time that the first farmers arrived, and that the two groups began to mix upon their arrival. This completely contradicts the Kurgan hypothesis, which asserts that Indo-Europeans invaded Western Europe thousands of years later, during the Bronze Age. The Loschbour genome was published in connection with this paper by David Reich and his associates, in which they pretended to have discovered that Europeans are descended from Neolithic farmers and two groups of Upper Paleolithic and Mesolithic hunter-gatherers. That Europe’s first farmers were physically distinct from the hunter-gatherers of Upper Paleolithic and Mesolithic Europe has been common knowledge for a hundred years. It has been understood since the archeological research of the early 20th century that there was physical heterogeneity among the hunter-gatherers of Upper Paleolithic and Mesolithic Europe. And knowledge of Y haplogroups R1 and I have made it obvious for over a decade that there were two genetically distinct groups of Upper Paleolithic and Mesolithic Europeans. In their paper Reich and his associates give the name “Ancient North Eurasians” to Y haplogroup QR Caucasoids like Mal’ta 1 and Afontova Gora 2, which is idiotic. Y hg NO Mongoloids were also “Ancient North Eurasians”, but they were of course distinct from Y hg QR Caucasoids. Y hg I Caucasoids were “Ancient North Eurasians” too, but they were also distinct from QR Caucasoids. The Y hg P and QR ancestors of the QR people of Europe and Siberia inhabited Pakistan, Afghanistan, and Central Asia, so they weren’t “Ancient North Eurasians”. Reich and his associates give the name “West European Hunter-Gatherers” to Y hg I Caucasoids like Loschbour, which is also idiotic. 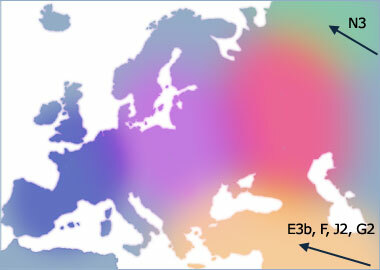 The name assumes that hunter-gatherers genetically similar to Loschbour were at one time confined to Western Europe, which is certainly false, given that Y hg I spread across Europe from the Balkan peninsula. – You mean that both Loschbour and La Braña (the only two Y-DNA samples available from Mesolithic Western Europe) are exceptions and that actually most other inhabitants were R1b? (And La Braña is C6, not even I, so who know where he came from). – Why Russians don’t have any Gedrosia admixture, but Western Europeans and Pakistanis do? Did the Gedrosia admixture developed INDEPENDENTLY in these 2 extremes? – You associate Gedrosia with R1b, but people who have higher Gedrosian admixture are mostly R1a (around Pakistan)? – In k12b, doesn’t the caucasus admixture look much more like a Mesopotamian origin (Otzi and Sardinians have this admixture + European, but they have not much to do with R1a people)? You mean that both Loschbour and La Braña (the only two Y-DNA samples available from Mesolithic Western Europe) are exceptions and that actually most other inhabitants were R1b? Yes, that’s what I believe. First, as I noted in this comment, two samples aren’t sufficient to come to any definitive conclusions about what haplogroups were common in Mesolithic Western Europe. Second, I think that Upper Paleolithic and Mesolithic R1b people usually disposed of their dead in archeologically invisible ways. I discussed this in this comment. I cited this article, which notes that the Gravettians usually disposed of their dead in such ways. There are, however, a few known Gravettian burials. For some reason almost all of the individuals from these burials suffered from pathological conditions. I think that if Y-DNA can be obtained from these individuals, it will be found to belong to haplogroup R.
The successors to the Gravettians in Western Europe were the Solutreans. I think that the Solutreans were R1b. In this post I included a quote from the book Across Atlantic Ice which notes that no Solutrean burials have been found. The successors to the Solutreans were the Magdalenians. There are a few rare Magdalenian burials, and if Y-DNA can be obtained from them I think it will be found to be R1b. If burial only became the norm among R1b people in the Neolithic, then barring the above exceptional cases, we won’t find any R1b in samples from pre-Neolithic times. Third, I think that Loschbour lived at the western edge of the Y hg I range 8,000 years ago. I think that to the west of Luxembourg R1b was predominant, while to the east of Luxembourg I was predominant. I think that C1a2 (formerly C6) was concentrated in the Balkan peninsula before the Holocene, just like I. Why Russians don’t have any Gedrosia admixture, but Western Europeans and Pakistanis do? Did the Gedrosia admixture developed INDEPENDENTLY in these 2 extremes? No. I discussed this in this post. I think that the alleles that make up the Gedrosia component originated in Pakistan tens of thousands of years ago, and were later brought to Europe by the Y hg R Gravettians, who were ultimately descended from Y hg P Caucasoids of Pakistan. I think that the Gedrosia alleles became heavily diluted in the R1a people of Eastern Europe, through admixture with the Y hg I Aurignacians. You associate Gedrosia with R1b, but people who have higher Gedrosian admixture are mostly R1a (around Pakistan)? 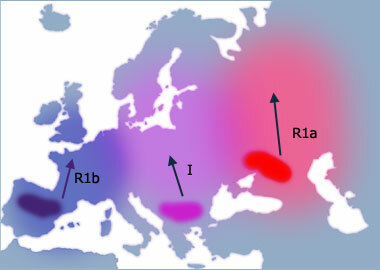 Within the European continent, the Gedrosia component is strongly associated with R1b, while it shows no association whatsoever with R1a. It is true that there is a lot of both the Gedrosia component and R1a in Pakistan, but there is no positive correlation there between the amount of the Gedrosia component and the frequency of R1a. For example, the Burusho have 43.2% of the Gedrosia component, but they’re only 6.5% R1a. On the other hand, the Hazara have one of the highest frequencies of R1a in Pakistan at 70.9%, but they only have 20.5% of the Gedrosia component. As I said above, I think that the Gedrosia alleles were in Pakistan tens of thousands of years ago, long before the R1a-Z93 Aryans from Europe invaded Pakistan and India around 1500 BC. I don’t think the Aryans brought any additional amount of the Gedrosia component with them. In k12b, doesn’t the caucasus admixture look much more like a Mesopotamian origin (Otzi and Sardinians have this admixture + European, but they have not much to do with R1a people)? The Caucasus component isn’t associated only with R1a. It’s also associated with J2 and G. Europe’s first farmers were predominantly G, so they carried some of the Caucasus component. Yes, I completely agree that just 2 random samples are absolutely not enough to make conclusions about which haplogroup was dominant in Western Europe during the Pelo/Mesolithic. And also I agree that linking haplogroups with modern day admixture is somethign that will lead to confusion (we have many examples of different populations (by admixture) who share the same HG, and similar populations with different HG. It sounds perfectly possible that R1b came from Pakistan in the Paleolithic. Probably going up to Central Asia, and from there moving west, by the south coast of the Caspian Sea and the Black Sea (through Anatolia), then following the Danube to Central Europe and from there finally establishing in Western Europe. As always, we’ll need ancient DNA to get definitive answers.